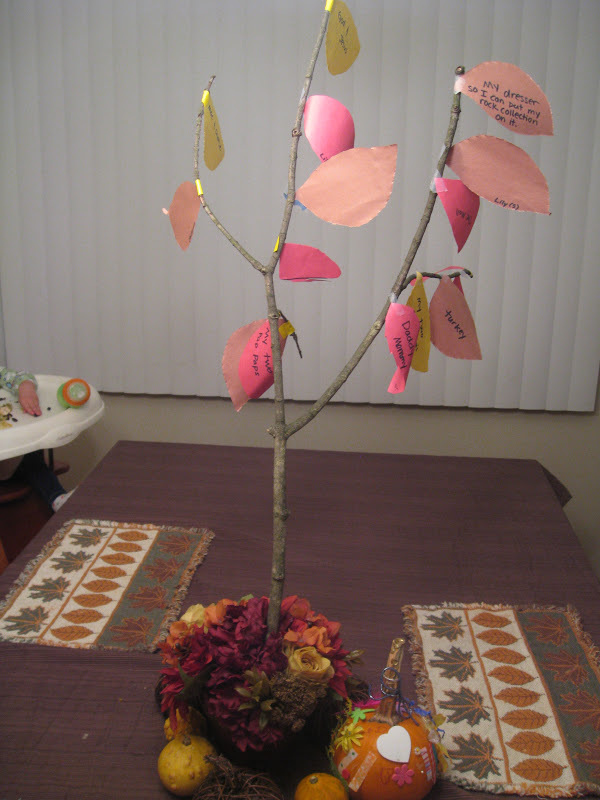 We have a tradition of making a Thanksgiving Tree this time of year. It is one of my favorite things about this season. We started the tradition of making a Thanksgiving Tree three years ago. 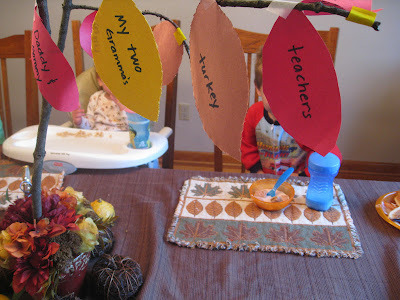 The kids and I will pick a stick from out in the yard and bring it in for a centerpiece on our dining room table. One of the kids or I will cut leaves from construction paper and they will tell me all of the things that they are thankful for. I love to hear the things that they are thankful for. 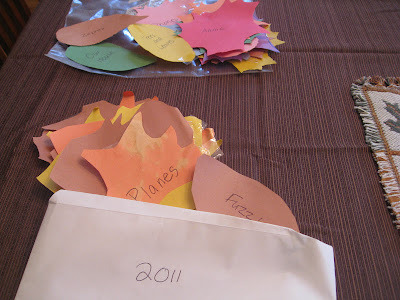 I have been saving the leaves from each year in an envelope labeled with the year and keep it in a storage bin in our attic, along with the rest of our fall decor. It was so much fun this year to read the leaves along with the kids. They loved hearing what they said last year and the year before. We had quite a few leaves dedicated to various stuffed animals, a leaf expressing Big Brother's thankfulness for our neighbor's dog, and a leaf that commemorates Big Sister's fondness for Miss. Hannigan from Annie. There are the sweet ones that say "my little brother", "my baby sister", "Grandparents", "my sippy cup", and "Mommy and Daddy". 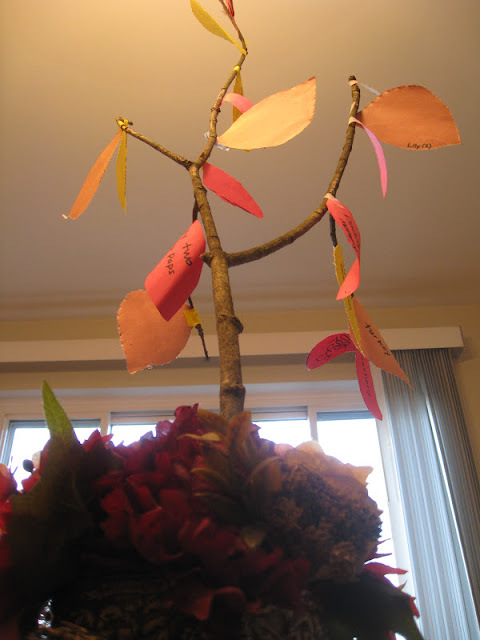 We tape the leaves on the stick and prop it up in a centerpiece to enjoy all season long. They love to look at it during meals and say "What does that brown one say, Mom", or "Does this one say cousins?" 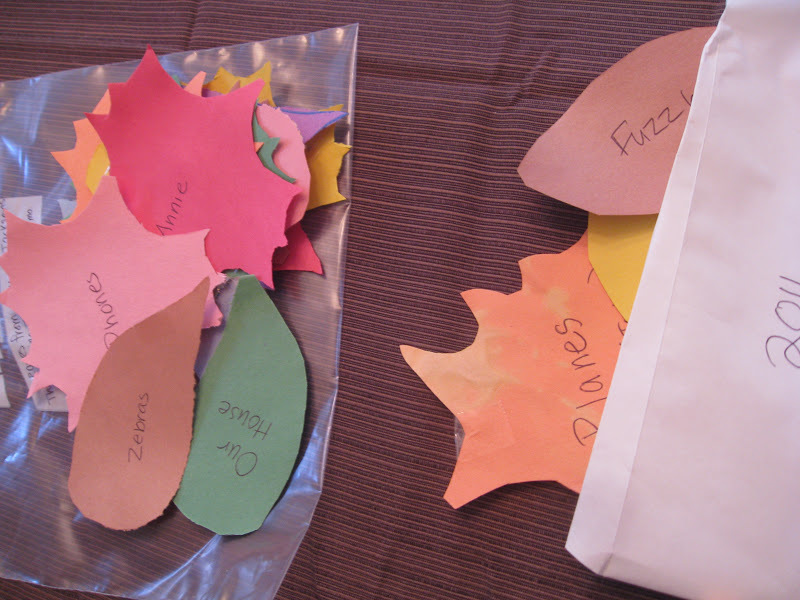 In previous years, I would start them out and say "I am thankful for..." and write my own leaf. 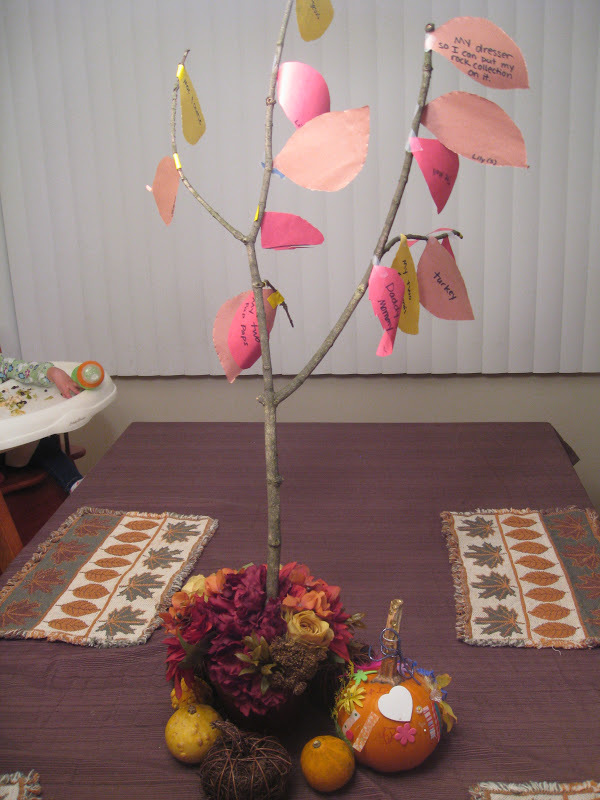 Big Sister did a pretty god job the first year of coming up with her own ideas. Last year Big Brother was 2 and was able to identify some things on his own ("my silky blanket"). 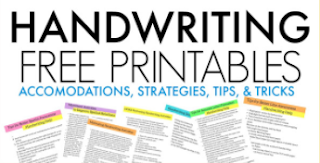 This year, Big Sister helped to write them in her upper case letter, new-writer handwriting... and I know I am going to look back at them years from now and LOVE reading them! 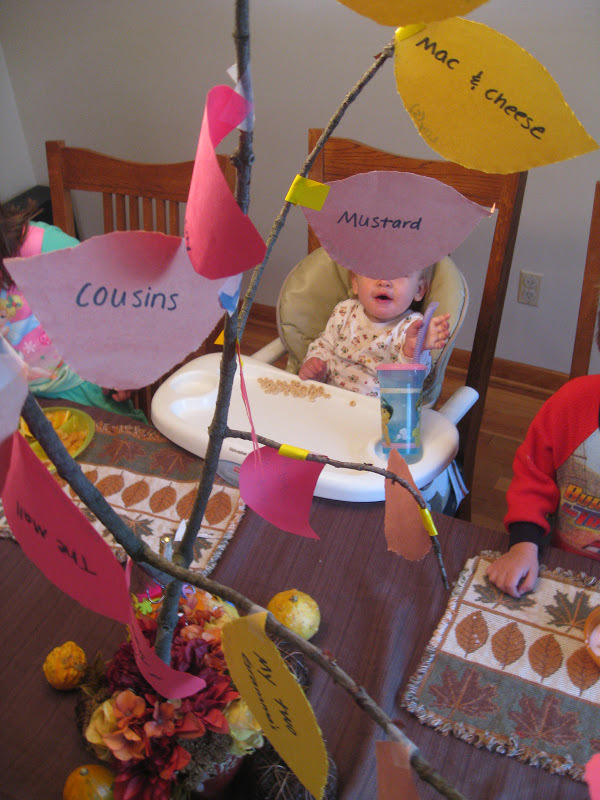 They love this centerpiece on the table during meals...and this year, big sister is able to read some of the words herself. Little Guy will ask her what they say and she'll tell him "It says HOME". 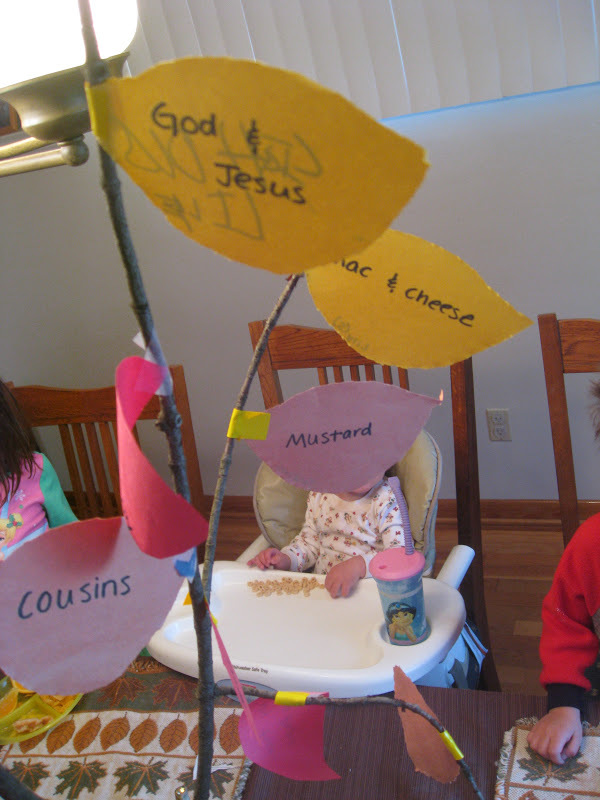 Some of the cute ones this year..."God and Jesus", "the mall", "mac and cheese", and Little Guy was sure to express his gratitude for "mustard". 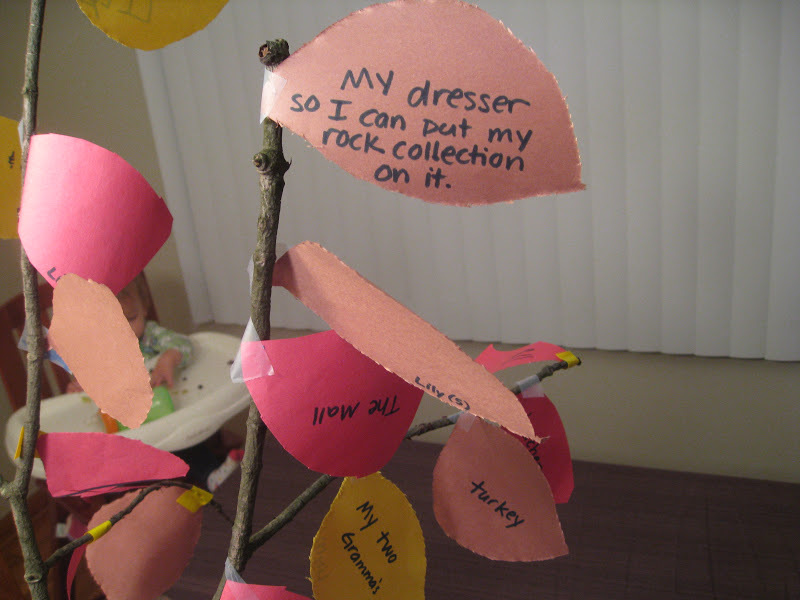 And of course, where would Big Sister's rock collection be without the dresser?? ?